This is our sweet crochet headbands, bows and hair decorations! We just love them. 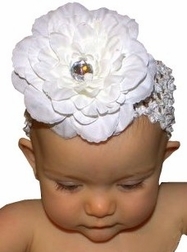 The headbands are crocheted with the softest material, and are so so comfortable for her little head. They are perfect for babies and little girls. Big girls love them too! You can interchange bows or flowers; Bows and flowers sold separately.